Beautiful campground but not for big rigs, we booked campsite 38 and even though it was long enough we could not back in due to the tree lined road. If you are under 32 ft highly recommend but anything bigger be warned. We camped at Wekiwa Springs State Park in a Fifth Wheel. We stayed in the Oasis section, great sites with plenty of room. This section was very clean with nice facilities and a great dog park. We had to move sites due to satellite issues, they were very accommodating with our request. Great location to visit St Augustine. We camped at Compass RV Park (formerly Indian Forest Campground) in a Fifth Wheel. We enjoyed visiting old town, San Sebastián winery and the Fountain of Youth. Spent the day on St Augustine beach which was nice. Nice park close to interstate, Bluffton and Hilton Head. Sites are very large with concrete pads and full hookups. Park is very clean and updated. Nice pool and laundry facilities. We would stay again, rates a bit high but worth having such a nice site. We camped at Camp Lake Jasper RV Resort in a Fifth Wheel. In old town Bluffton try the Cottage restaurant. Very quaint with excellent food, they even had a doggie menu for our pup. We have a 41' 5th wheel and stayed in the back row, we fit barely. We had to park the truck on the road. Nice level site with just enough room between sites. Full hookup, great rates with free breakfast and lunch. Very convenient to Tampa. We stayed for service on our RV and would stay again. We camped at Lazydays RV Campground in a Fifth Wheel. Eat at the Columbia in Tampa, oldest Spanish restaurant in the United States. Great experience and delicious food. We stayed for an overnight stop, very convent to I-95. Nice park, with a great staff. We had a pull thru which was long enough for our 5th wheel and truck. Clean, friendly park that we would stay again when traveling though. We camped at Stagecoach RV Park in a Fifth Wheel. Wonderful, inexpensive New Mexico State Park campground on a bluff overlooking Elephant Butte Lake. The campground is a great find as it had very large sites, great views at a price you cannot beat. We went in the early summer which was OK as we had some wind blowing through. Winter, I'm sure, is wonderful at this park. It is a good drive to get to town so pack up before you come. This campsite does not have sewer but does have electric and water. We wanted a site over the lake so we didn't get 50amp. If you need 50amp be careful about the site you pick as there is mixed amps thru the campground. Very peaceful and quiet campground to relax or enjoy the water. We camped at Elephant Butte Lake State Park, South Monticello Campground in a Fifth Wheel. Star gazing is amazing, stay up late and watch the sky fill with stars. 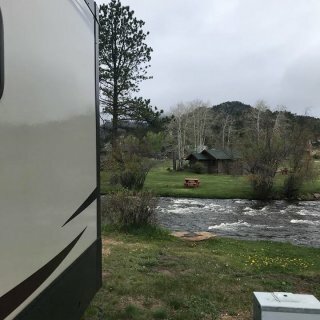 This park is right in Estes Park with easy access to Rocky Mountain National Park. The park is older but the views and location are absolutely amazing. 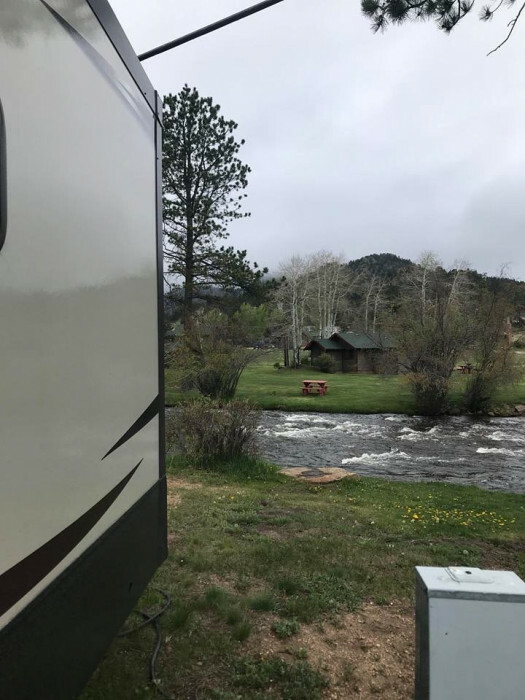 We saw Elk roaming the campground and our site was right on the river. The sites are tight and the price is high but so worth the 2 weeks we stayed. The staff is great and very helpful. We would stay again if visiting the area. We camped at Manor RV Park in a Fifth Wheel. If your going into RMNP, go early as the traffic gets backed up. Also early morning is best time to see the wildlife. We saw Elk, Moose and BigHorn Sheep. Antonio's Pizza was awesome, highly recommend. We also did the Stanley history tour which I highly recommend. Great spot for an overnight stay right off the interstate. We had a pull thru site which was spacious enough. Staff is very friendly. Town is a bit run down but there is gas stations close by. Our dog was not too happy with all the bunnies but we enjoyed them. We would stay again for an overnight. We camped at Limon KOA in a Fifth Wheel. We stayed for an overnight trip thru Kansas. Cute campground with lots of unique features. Office was very nice and helpful. Site was level with full hook up. Cell service was excellent. Would stay again for an overnight. We camped at Mill Creek Campground & RV Park in a Fifth Wheel. We ate at the Long Branch bar which had excellent food. Also some cute antique shops in town we didn't get to explore but would next time. Beautiful old state run campground on Carlyle Lake. We stayed in site #7 that had a view of the lake. Lots of shade, but watch out for your falling branches. Park was quiet when we were there but understand that it fills up in the summer. The only issue we had was no sewer, you either have to use the public showers/restrooms if you are staying long or pull out and pump out at the general pump station. We would stay again but for a shorter time due to that. Cell service was excellent (Sprint and AT&T) but we could not get our DirecTV satellite to come in due to all the trees. We camped at Illini Campground / Eldon Hazlet State Recreation Area in a Fifth Wheel. We stayed for one night and was put in the front parking lot area with a pull through site. The owner is very helpful and friendly. It rained while we were there and was sitting in a mud puddle. The area is rocked but very little and was frustrated with all of the mud. The overnight area is very tight but we did not have any issues getting in. We camped at Fern Lake Campground in a Fifth Wheel. We stayed overnight in a pull through site. Campground was a bit run down but owners were pleasant and very helpful. Was right off the interstate and easy to get to and sites were level. Would stay again for just overnight if passing through the area. We camped at Peach Queen Campground in a Fifth Wheel. Nice park for an overnight stay. Office is very friendly. The site we stayed in was not level and it took us a bit to get setup. Gas station close by which was very convenient and right off the interstate. Minimal noise from the interstate. We camped at A Stone's Throw RV Park in a Fifth Wheel.